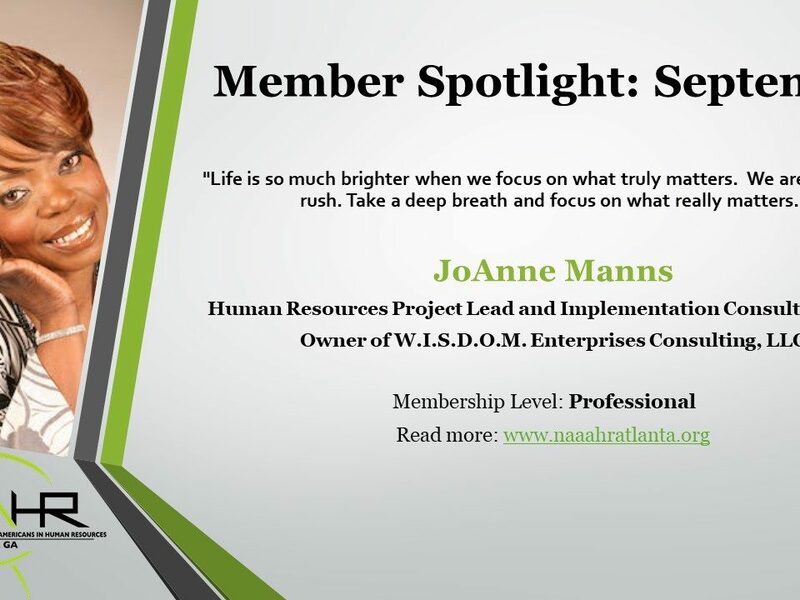 You may know by now that every year, the Atlanta Chapter of NAAAHR awards its Excellence in HR Scholarship to support future HR leaders who are engaged in completing their undergraduate or graduate education in Human Resources or HR-related fields of study. 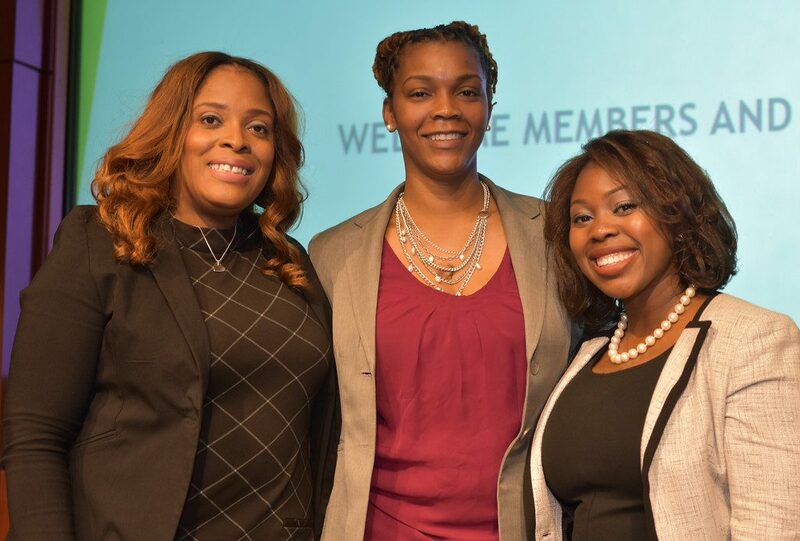 Thanks to your continued support, we were able to increase the number of scholarships awarded to three well-deserving students last year: Natasha Hartry, Katrina Shackelford, and Sarah Amuka Williams. I was able to catch up with them this month and find out a bit about what they’re up to now. 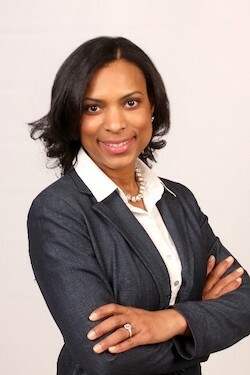 Natasha Hartry is from Milledgeville, GA. She graduated college with a degree in Journalism and had her first job in Human Resources early on in her career but shifted her focus to explore a few different paths before coming back around full-circle to pursue a graduate degree in Human Resources. She is currently at Troy University pursuing her Masters in Human Resources Management. “No matter what job I had I was always thinking about Human Resources. I always thought about why processes were the way they were. I thought about things like efficiency, employee relations, and how employees are treated at work. I learned about NAAAHR while volunteering at an HR Conference and have been coming out to events since last year, even before becoming a member. I’ve enjoyed attending the events and meeting like-minded HR professionals who are so positive and encouraging.” Natasha’s anticipated graduation date is October 2017, at which point she plans to prepare to take her HR certification exam. She recently accepted a position as an HR Coordinator with Ryder System, Inc. (yes, the trucking company). Katrina Shackelford is from Atlanta, GA. She graduated college with a degree in Business with a specialty track in Human Resources. She began her career path in Human Resources in high school where she completed an HR internship at Decatur High. 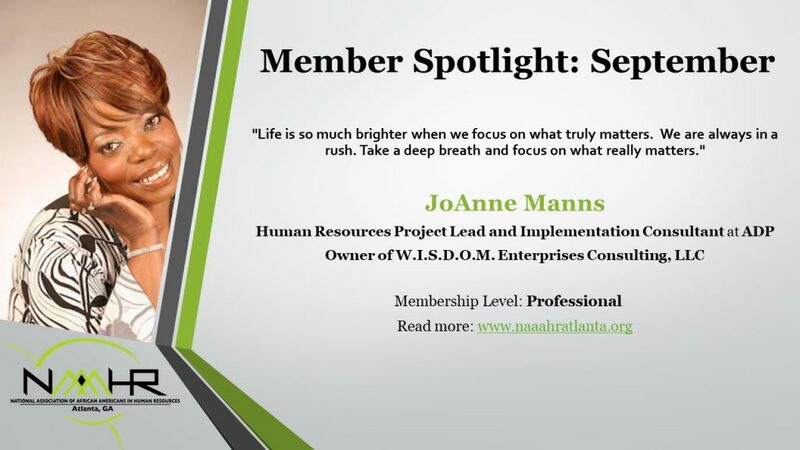 “I took the opportunity to transition back into HR with DeKalb County School District as an HR Data Tech and an HR Analyst after working in the Finance field for a few years. I found out about NAAAHR and the scholarship program through my father-in-law and a couple of friends who are also members. NAAAHR has helped me to gain more knowledge about the industry. I’ve met some interesting people who have opened my eyes a bit and I have seen the power of networking. I’m excited about the other opportunities that the organization will open up.” Katrina’s anticipated graduation date is March 2018. She is currently working as a Human Resources Management Records Specialist for the Atlanta Public School System and also plans to prepare to take her HR certification exam after school to position herself for further advancement in the field. Sarah Amuka Williams is originally from Nigeria and has been in Atlanta for about 20 years so it’s kind of like she’s from Atlanta too. She is currently pursuing her Masters in Organizational Development with a concentration in Change Management. Sarah began working as a Change Management Analyst in the Systems and Technology Department of a large retailer but had known since college that she was also interested in the field of Human Resources. She later landed an opportunity as an HR Coordinator for a sports franchise which allowed her to get a better picture of the field of Human Resources. “After working as an HR Coordinator I had the opportunity to transition back into tech, but I needed to find a way to blend both fields. I had conducted several informational interviews with people in HR and after digging deeper I found out about organizations like SHRM and NAAAHR. 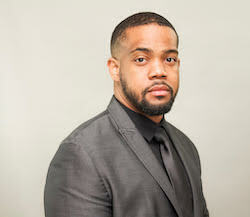 I’ve been gaining tools from the chapter meetings to use in the field, I have connected with connectors, and when I was new to the field I took NAAAHR’s PHR prep course for a great rate! Anytime you make a point to develop yourself you want to make sure that you are doing the best in class and NAAAHR provided that for me.” Sarah’s anticipated graduation date is May 2017. She recently accepted a position with a large global tech company where she will have the opportunity to blend tech and HR working in the areas of Org Development and Org Effectiveness, helping the company to maximize their Human Resources processes through technology. These short summaries above really do not do these amazing ladies justice. Which one of these ladies is the American explorer well on her way to seeing all 50 states? Which one is the skydiving whitewater rafter? Which one is the dog whisperer and self-proclaimed karaoke superstar? Come on out to this month’s chapter meeting on April 12th and find out for yourself as you meet them and other like-minded professionals in Human Resources and other fields. While you are registering for that, don’t forget to check our monthly calendar for a schedule of upcoming events. Advance registrants get a discounted rate from registrants at the door so don’t delay. Register today!